WAFFLES: Ok, Boss. I'm posing in the new picture room just like you told me to. KATIE: PHOTO STUDIO, Waffles. Photo studio. Not picture room. 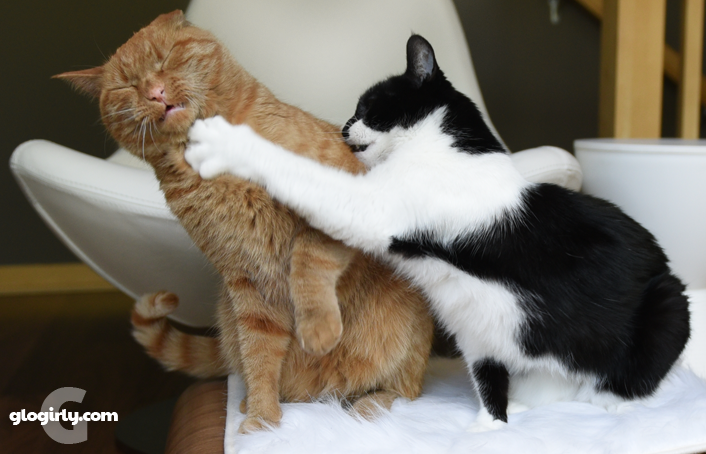 We're purr-fessionals professionals, you know. WAFFLES: Does the new dark floor make me look more handsome? KATIE: Waffles, I'm pretty sure that if anything is making you look handsome, it's my new lounger. ...MY new lounger. WAFFLES: Cool, where'd you get it? KATIE: I won it from the Hauspanther Cat Style Lounge at the BlogPaws conference. It's from a company called Vesper. 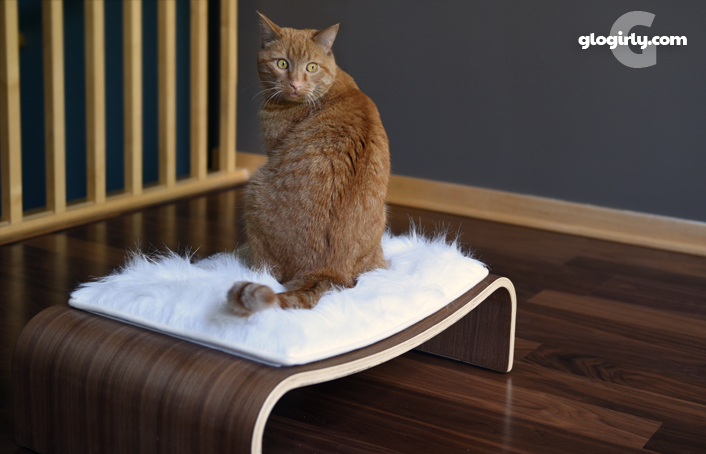 KATIE: Graceful and modern bent wood design, rich walnut veneer and a plush white faux fur pad. This has my name written all over it. 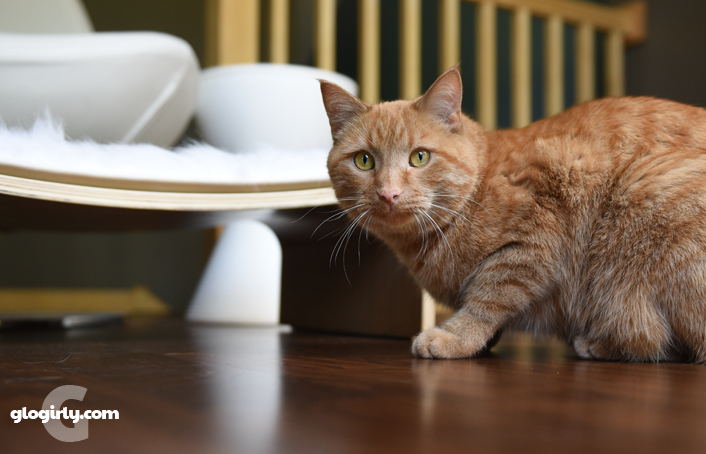 WAFFLES: What about MY name? Doesn't it have my name on it too??? KATIE: I'VE got your name, Waffles. KATIE: I've got your name right here. We were pretty excited to see how things looked on our new walnut floor. Katie thinks it's much more glamorous and provides a nice contrast to her classic black & white wardrobe. Waffles thinks it makes him more handsome. It's all about the ladies with Waffles. The beautiful new lounger we're featuring is one of our recent fab finds. According to Glogirly, it was one of the coolest things in the Hauspanther Cat Style Lounge at the BlogPaws conference. And even MORE cool is that she won it in a drawing. 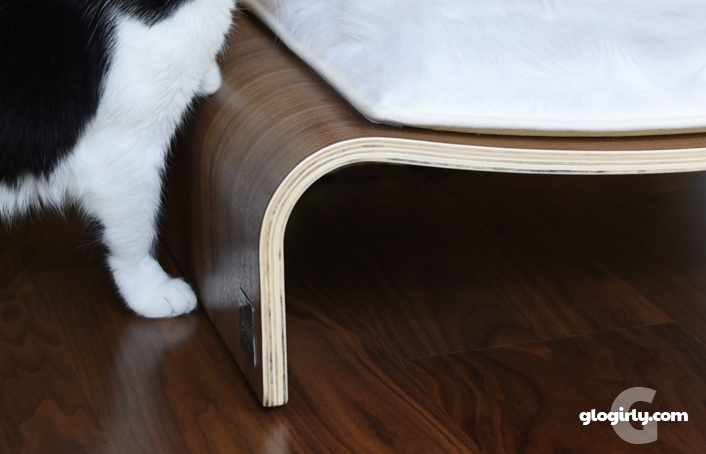 It's from Vesper, an innovative company focused on bringing together beautiful design, cat-friendly materials and meticulous workmanship. This isn't an 'official' product review, we just love their product and wanted to share it with you today. 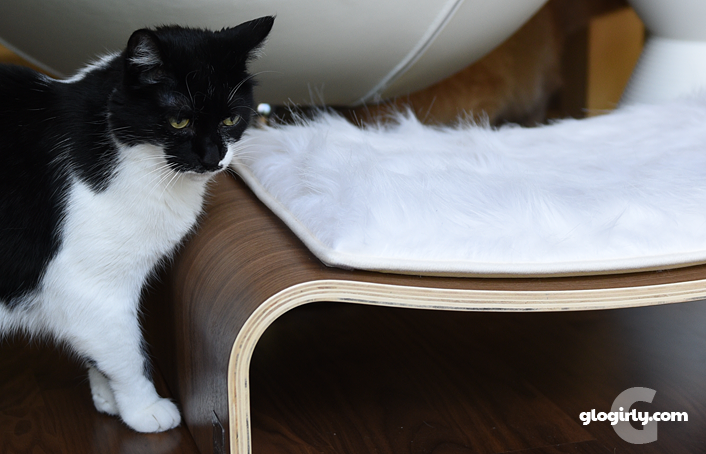 You can see the full line of Vesper cat furniture HERE. The same lounger we have is also available on Amazon. This post contains an Amazon Associate link. This means that if you decide to purchase through our link, we get a small commission. We only spread the word about products and services we’ve either used or would use ourselves. We love your new floor and the v-lounge. Mom Paula was taking photos of us this weekend with a white toy on a gray carpet with two white/silver cats! We definitely need to find more contrast in our house for better photos. Your floors looks gorgeous. I was eyeing up that lounger but won something else that was not practical so I left it for donation. 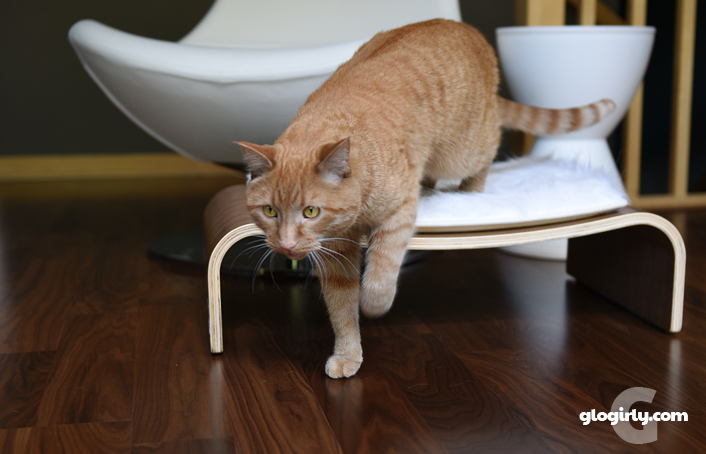 The floor and the lounger look pawsome! My human is envious of your beautiful floor! Although she is decidedly not envious about what you had to go through to get it. Wow! We love the floor & lounger too! We really like the floor in your photo room but think there might be a squabble over the new lounger! 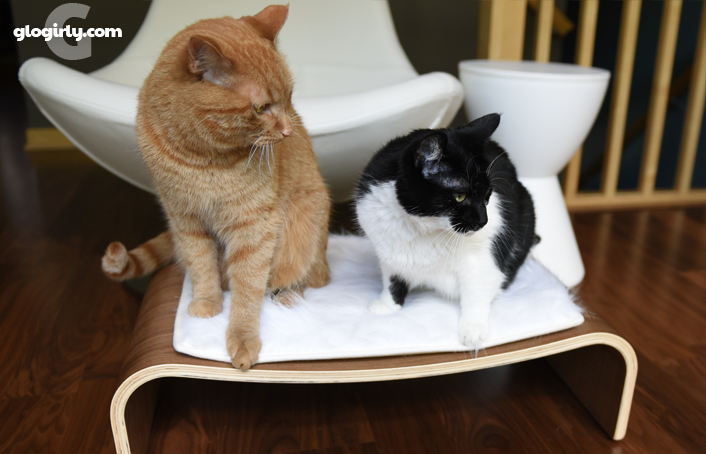 Clearly, that lounger is not made for two cats at a time! At least not if Katie is one of the two. Your floors are lovely. We hope you never have any more floods in the townhouse! Katie looks so petite next to Waffles. And she has a good left hook! Als,,,you both are very professional! 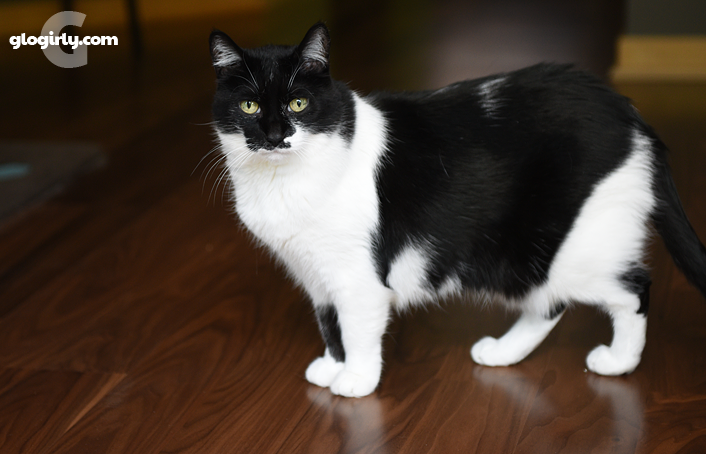 The floors are gorgeous and really help show off your beautiful furs! The floor looks pawsome! Waffles, you'll really show up well on it. And that lounger?? Now we want one! Don't feel bad Waffles...we have a "picture room" here too..... hehehe....love the darker floors...we have a darker cherry in our living/dining room and hallway and I LOVE it! One day if we can ever afford it, will get the back part of the condo done too. Very nice studio.Poor Waffles, Katie is so mean to you. Your new floor is beautiful, and your new lounger looks comfortable! We hope you both have a chance to enjoy it. Beautiful flooring. Waffles your always handsome and Katie beautiful. Enjoy your week. Wow! Beautiful photos and places! Waffles..you definitely look more handsome on that beautiful dark floor...Katie...whoa girl..that's an awesome left hook you got there..will that boy ever learn not to mess with you..love your new lounger..
You look stunning no matter where you are! Ha! Yes, your new dark floor makes you both look extra handsome. And what a cool kitty lounger! Hauspather is the best curator of cat products in the world, is she not? Dat's bootyful and y'all look gweat. The floor looks beautiful. The lounger is lovely too. That is a very stylish lounger!!! The new floor looks really sharp... and so does the lounger. Dark floors with light colored baseboards. Mum isn't too sure on that. What does she know. Looks grate guys. Last photo is best photo ever! Who was it that always said, "Pow! Right in the kisser!" You go, Katie! One concern, won't clumps of orange fur show up on that dark floor? Better get a Roomba - Waffles can ride it and clean up his own fur.